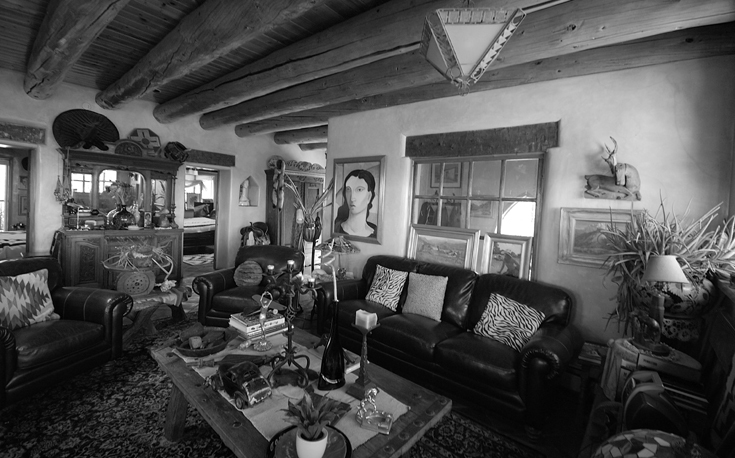 It takes a while to absorb and understand the scale of Thom’s adobe house and studio in Taos, New Mexico. If at first glance from the outside it looks like an ancient castle, with its large tall entrance ways and wooden beams, then stepping inside is like entering the great hall. The high ceilings, giant fire place, and Thom’s amazing art everywhere overwhelms the senses. 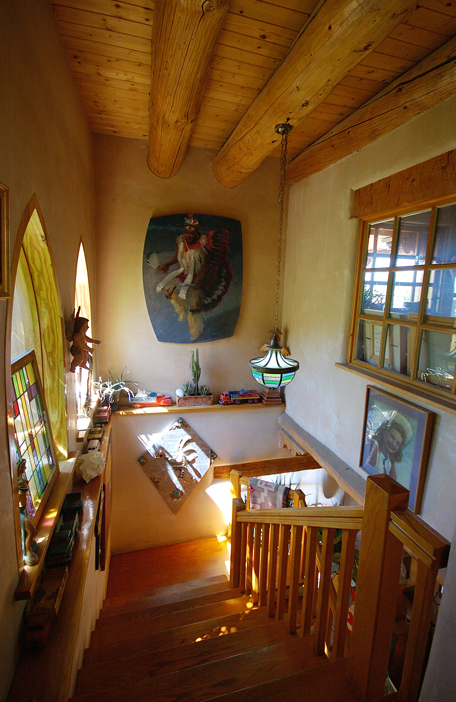 I came to see Thom’s place because I wanted to understand the possibilities of contemporary adobe building. Although not intended as a low cost or particularly ecological build it does help illustrate the creative potential of adapting ancient techniques for new environments. Thom said he chose adobe for aesthetic reasons but has found the house to be ideal for retaining heat in winter and being cool in summer (his main heat source is radiant under floor heating). It is the ability to mould and shape adobe that is particularly appealing here – the curved sculptural look and as Thom says ‘you can’t get a perfect finish with adobe and that imperfect look makes it wonderful’. 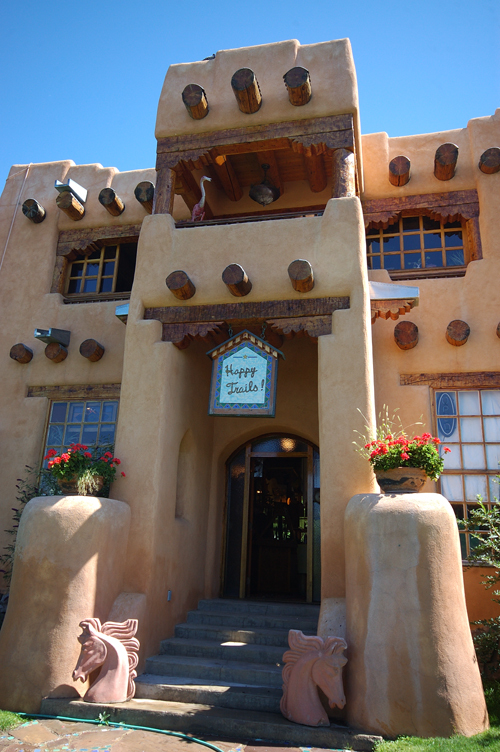 Completed in 1985 it was built using 3,600 adobe bricks from Ohkay Owingeh (previously known as San Juan Pueblo) and local wood for the beams, and its floor footprint is a total of 4,200 square foot, though 1,000 foot of that is just for the porches. 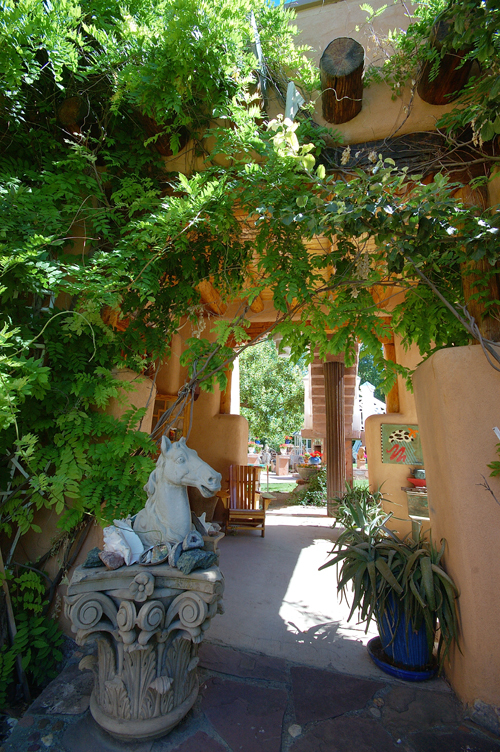 Most unusually compared to other contemporary adobe builds it is two storey with 16 foot (almost 5 metres) ceilings. There is something to be said for the robust safe feeling that a house this size made from adobe gives you. 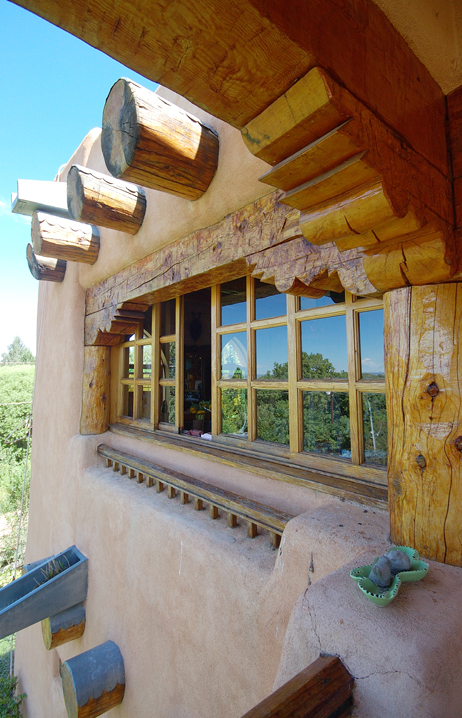 With walls 30 inch (76 cm) thick there is a solid and secure feeling to the structure and of course its historical precedent in this region of New Mexico helps it sit in the landscape. It is also exceptionally long lasting and has been designed to last 1,000 years. Adobe, especially on this scale, is expensive and Thom argues that ‘adobe is the most expensive way to build a new house. It is very labour intensive and you have to maintain it. It takes a long time and most people don’t have two years to build a house’. He has tried to mitigate some of these requirements by using stucco on external walls to reduce the amount of maintenance needed. Stucco is a render which was traditionally made from lime, sand and water, but now tends to use Portland cement instead of the lime, making it less than ideal environmentally. It is a difficult compromise given that adobe buildings need recovering every few years which is labour intensive and thus expensive. 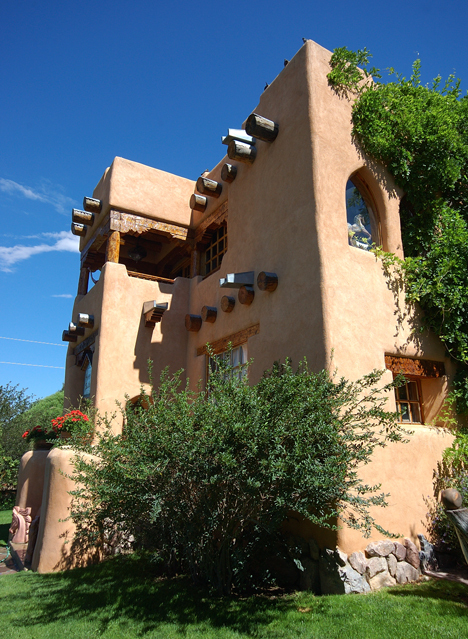 As a result many contemporary buildings in New Mexico might be designed to look traditional but in fact are only partially adobe. But Thom’s house teaches us that innovative design and majestic aesthetics can be created from ostensibly ecological materials. Thus perhaps encouraging people who might have little concern for the environment to experiment with these methods and materials purely because of the aesthetics (and the reduced heating bills) could broaden the appeal of green building. In other words it is not always necessary to advocate green building as being about the environment or saving money, but sometimes it is worth celebrating that eco-houses are often simply more beautiful. The more I looked around Thom’s house the more there was to see, not just because of his amazing art, but the building as a whole felt like an adventure into the amazing possibilities of what a home could be. For further information about Thom Wheelers House and Studio see his website: http://thomwheeler.com and an interesting article about his build by Kate Winslow. 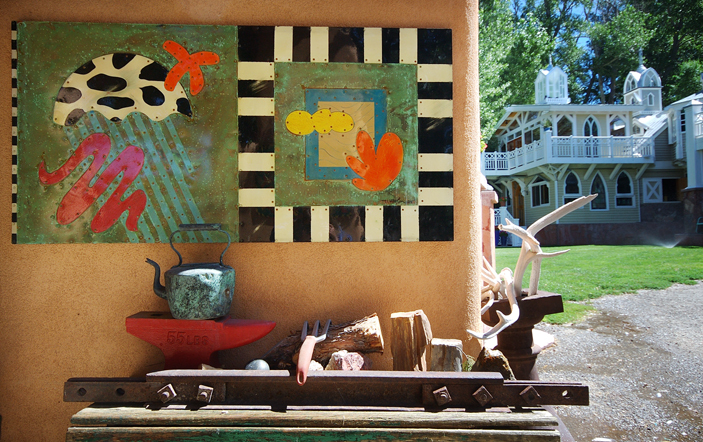 His studio in Taos is often open to the public. 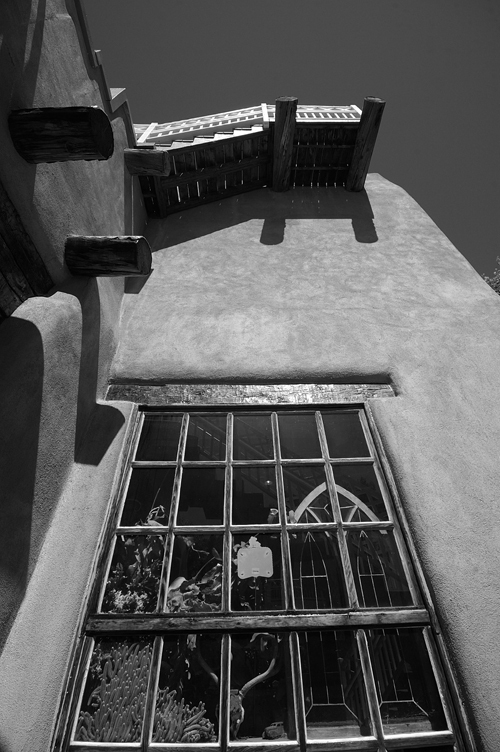 Further information on the use of adobe in New Mexico is available in the excellent book by Carol Crews – Clay Culture: Plasters, Paints and Preservation (2010) published by Gourmet Adobe Press. Amazing house! Living in Colorado and being a green building enthusiast, I’m always trying to sway my father and his business to be more proactive with regards to my enthusiasm in green building. I’ve slowly been able to change his mind over time. Thanks for the interesting and informative article. Love the photos as well! This is a beautiful home. My husband and I built an adobe house on a ranch in West Texas, finishing it in 2,000. He wanted two of the porch floors to be made of adobe. When the adobe dried it made wonderful designs which we outlined in a mixture of adobe mixed with black and red powder mixed together. I cannot find the formula for that paint powder. Would you all have an idea? I don’t know the receipe either I am afraid, however, have you seen the book by Carole Crews ‘Clay Culture: Plasters, Paints and Preservation’, I have found it brilliant for all things adobe. Some really cool real estate. Here in Chandler, Tempe, and Mesa we have some properties that have that nice Adobe feel.